Despite unfavorable market conditions, prices of onions have increased from a July low of Rs.12 per kilo in Colombo markets, to a respectable Rs.40 to Rs.50 per kilo, according to traders dealing with perishable goods. Market watchers earlier warned that unplanned cultivation and increasing use of artifical fertilizers in Jaffna would result in oversupply leading to plunging market prices. Kandiah Paranjothi (55), an onion farmer from Udupiddy located 20 km northeast of Jaffna, who owns a plot along the Udupiddy-Thondamannar road, says his field produces nearly 50 hundred-weights (hundred-weight=112 lbs) of onions per season. He expects to earn close to Rs.100,000 per season with the current market prices. 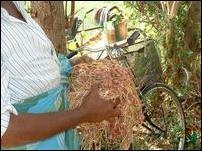 Onions are cultivated twice per year in Jaffna, December-February and again in June-August. 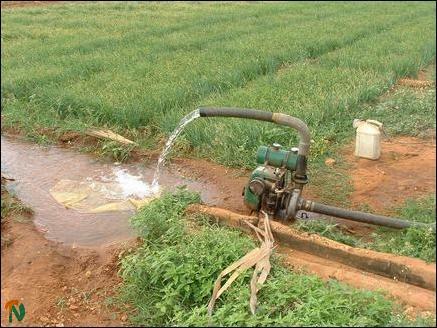 Farmers depend on water from wells for irrigation. 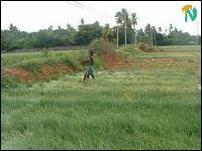 Approximately 45% of the revenue is used for fertilizers according to Paranjothi's estimate. Assuming 15% for kerosene for his water pump and additional labor-help during harvesting, a typical onion farmer is left with about Rs.80,000/- a year to make a living. Paranjothi is one of the lucky ones. He was able to return back to farming his field after being displaced for four years in Visvamadu in Vanni. He eked out a living there but returned soon after the Memorandum of Understanding (MoU) was signed between the Government of Sri Lanka and the Liberation Tigers in 2002. His field is located several miles outside the High Security Zone (HSZ) and he did not suffer the fate of many other farmers who are still struggling to recover their land. "My only worry now is to get my daughter married," said Paranjothi when asked how he viewed the current peace climate. "She has received proposals but does not want to go abroad. I would like to have her settled when things are normal," he added. Bunch of onions discarded from inclusion in the main marketable lot, used for local consumption or local sale.